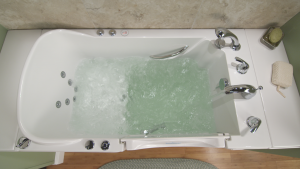 Having a walk in tub installed in your home in Des Moines, Iowa, can be a wise decision if you or a loved one in your home has trouble entering and exiting traditional bathtubs. For beautiful and high-quality walk in bathtubs, look no further than U.S. Patio Systems and Home Remodeling. Our walk in tubs are from the popular Safe Step Walk-In Tub Co., so you can expect an aesthetically pleasing tub that includes exceptional safety features that minimize your risk of slipping and falling. In addition to boasting a wide range of safety features, your new tub will also come with some spa-like features to help make every bath as enjoyable as possible. You’ll be able to relax and enjoy a heated seat as well as a water jet therapy system that can help calm symptoms of painful ailments like sciatica, arthritis, and back pain. Additionally, your new hot-tub-style bath can help you relax and forget about daily stresses. For more information on adding a walk in tub to your home in the Des Moines, IA, area and to learn about the installation services we offer, contact U.S. Patio Systems and Home Remodeling today.